The vegetative cells of some bacteria may put them under a great deal of stress, especially in a certain environment wherein they are deprived of nutrients such as carbon and nitrogen. As a result, they produce inactive form-endospore. This is their coping mechanism for them to survive even in an unfavorable environment. Endospore-forming bacteria are usually found in the soil as well as in the aquatic environment. Some can be found in medical settings such as in the case of patients with tetanus, botulism, and gas gangrene. Some of them can also be the reason for food poisoning. Anthrax is also caused by endospore-forming bacteria. Image 1: Endospore staining; a microscopic view of the cells being studied for. What is the significance of endospore staining? It helps in classifying and differentiating bacteria. What are the principles of endospore staining? Image 2: Endospore staining procedure. A primary stain in the form of malachite green is used for staining endospores. 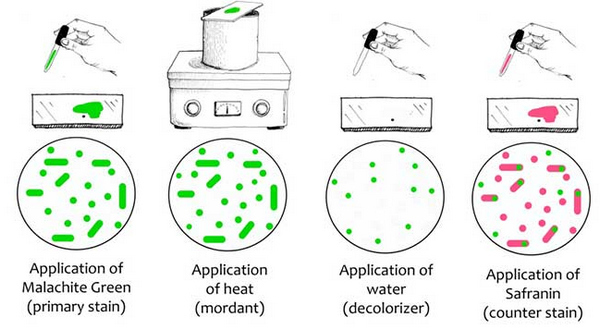 It uses the heating process to act as a mordant as endospores have the ability to resist staining. Such a procedure does not require the use of decolorizer because malachite green binds to the cell and spore wall. The dye comes right out of the cell is washed thoroughly. However, once the spore wall is dyed, the color will lock in it. The color of the vegetative cell is pink or reddish. The vegetative cells containing endospores should be stained pink. On the other hand, the spores are viewed as green ellipses inside the cells. How is Endospore Staining done? The staining method for endospores is done in two ways: Dorner’s Method staining technique (traditional method) and Schaeffer-Fulton staining technique (modified method). Image 3: An endospore staining procedure using the Schaeffer-Dulton Technique. Malachite green – it is used as the primary stain. The malachite green (0.5 grams) should be dissolved in water (100 ml). Distilled water – it acts as the decolorizing agent. Smear the sample to be studied at the center of the slide. Air dry the slide and heat fix. 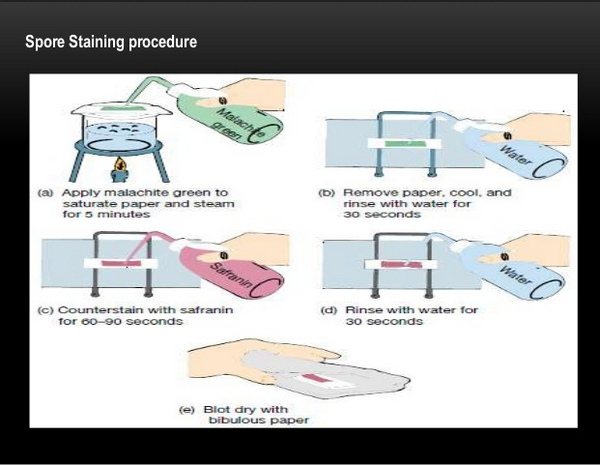 A blotting paper is put on the slide and the malachite green stain solution is pour on the slide. Place the slide on the heat until it evaporates. Boiling water or a Bunsen burner can be used to heat the slide. Heat, remove and re-heat the slide for about five minutes. Keep the blotting paper moist by adding drops of malachite green. The purpose of this step is to steam the slide and not to overheat it. Remove the slide and let it cool for a few minutes. Wash the slide. You can use distilled water or tap water whichever is available. Counterstaining is done using safranin. Rinse the slide and let it dry naturally. Note: Endospores have a permeable barrier, which prevents the dye from staining the cell’s structure. For staining to be made possible, the barrier should be destroyed first. The heat is used to destroy the barrier and enabling the dye to interact with petodoglycan. In other words, the heat acts as the mordant; a substance used together with the dye to completely fix in a particular material. Once the heat fixing is done, the next step is to wash the slide using tap or distilled water, whichever is available. The purpose of rinsing the slide with water is to decolorize the slide. Malachite green can be washed off easily because it weakly binds to the endospore, but once it is completely locked in the wall of the spore, it cannot be washed off easily by water. Endospores will retain the dye and it will be extremely hard to de-stain it. Once the initial washing is done, the next step is to apply safranin, which serves as the counterstain. It is done to counterstain the vegetative cells. As you notice, the colors used for primary and secondary staining are different. Image 4: An endospore staining method using the Dorner’s method. Apply a smear on the slide. Let the slide dry naturally. Apply heat either by boiling or using a Bunsen burner. Cover the smear with a blotting paper and saturate using carbolfuschin for about five minutes. Make sure you avoid overheating the slide. Get rid of the blotting paper and let the slide dry out. Decolorize the slide using acid-alcohol and rinse with water. Counterstain by adding a drop of nigrosine. Let the slide dry out. 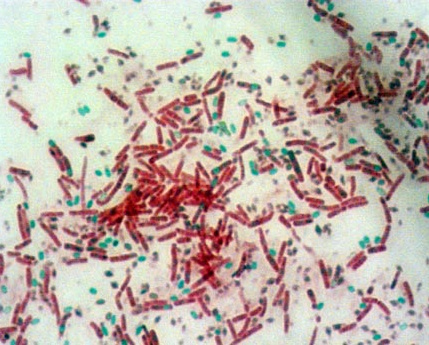 Note: When examined under the microscope, the endospores appear red in color.